China’s new E-commerce Law (“ECL” which entered into effect on 1 January 2019) regulates a wide array of matters, including antitrust issues, data protection, consumer protection, and the regulation of payment and delivery services, among others. However, the ECL’s provisions on IP protection seem to have attracted the most attention – both positive and negative. On the positive side, Article 15 of the ECL seems to target long-standing concerns over vendor anonymity by requiring sellers to display their business licence (or links thereto) on their home page. Meanwhile, Articles 10 and 11 require individuals who have set up trading accounts to obtain business licences and register with local tax authorities. If properly implemented, these provisions should help to reduce longstanding problems with fraudulent vendor accounts and substantially reduce the time and cost for IP owners investigating infringements. Meanwhile, Article 42 imposes joint and several liability on online trade platforms that knowingly allow the sale of goods that pose a risk to consumer health and safety – thereby offering a potentially powerful tool to act against items that are not deemed by platforms to infringe IP rights. On the not so positive side, Article 43 seems to require platforms to refrain from acting against alleged infringements where the vendor has filed a counter notice containing *prima facie* evidence of non-infringement – a provision roundly criticised by IP owners during the consultation phase for the draft version of the ECL based on fears that it will be abused on a grand scale by bad-faith operators. Questions have also been raised as to whether the ECL applies to social media platforms, including messaging services and video and photo-sharing services. Authorities were expected to issue implementing regulations to the ECL before its effective date, but drafters appear to have had a difficult time balancing the interests and concerns of the various stakeholders involved. As a result, the timeline for issuance of the implementing regulations remains unclear. China has made enormous progress over the past two decades in developing its IP protection laws and systems. But with the growth of online trade and the country’s production capabilities, it is no surprise that China is regarded as the single largest source of infringing goods worldwide. The Frontier Report (commissioned by the International Trademark Association and the Business Action to Stop Counterfeiting and Piracy) estimated that as of 2013 the scale of counterfeiting and copyright piracy worldwide was approximately $900 billion, with just over half estimated to emanate from China. The report concludes that infringements will increase by 70% in the next five years, perhaps taking the current global level to in excess US$1.5 billion. 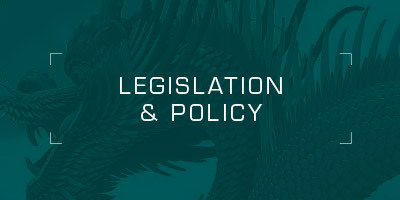 Following the example of other countries, the Chinese government and legislature have to date largely left the policing of online trade platforms, websites and social media to the platform operators and IP owners, with the (more than somewhat vain) hope that notice and takedowns and cooperation among them would keep the problem in check, thereby limiting the involvement of police and other government authorities. To its credit, the Chinese government has sought to guide online trade platforms and social media through both formal and informal persuasion, although largely behind the scenes and very much out of the public eye. While these efforts have had a definite affect, their visible impact on the total level of infringements has thus been clearly limited. While Alibaba and certain other smaller platforms have achieved a great deal through the current regime of self-policing, the overall levels of infringement, even on the best of Chinese platforms, remain deeply concerning. For even the most sophisticated and well-resourced IP owners, online policing is daunting in its scale and complexity, with few companies reporting a satisfactory return on investment from their enforcement work. The ‘whack-a-mole’ syndrome is now regarded as the inevitable outcome for most online takedown programmes. And while it may be argued that the most deeply affected are small and medium-sized enterprises, larger brand names also lack the resources to pursue IP violations on a scale that can keep pace with the challenges they face. While it may have been wishful thinking, industry and consumer groups expressed the hope during the ECL’s consultation phase that bolder solutions would be introduced, and that perhaps some of these new solutions might serve as a model for other countries. In this regard, trade associations representing mainly US and EU companies argued for the establishment of a higher duty of care for trade platforms, one that goes beyond mere notice-and-takedown model and instead requires platforms to implement proactive measures to address violations (i.e., actions that would prevent future infringements, such as insertion filters relying on Big Data software, strengthened intake procedures and more systematic auditing). These associations argue that the shifting of greater legal responsibility to platforms and other intermediaries is the only sensible solution, keeping in mind the intimate knowledge of their markets, products and customers by platforms, their already robust anti-fraud programmes, the balance of convenience and other relevant factors. These proposals were clearly rejected by drafters of the ECL. While the reasons for this rejection are unclear, it is reasonable to assume that they simply followed prevailing practices overseas and were encouraged by the arguable success of Alibaba and other platforms in controlling IP violations through proactive measures adopted on a voluntary basis. While the end result seems predictable in hindsight, it was hoped that Chinese drafters of the ECL would be swayed by the views of their own judiciary. In fact, various opinions issued a few years prior to the ECL by the Beijing Higher People’s Court suggested a proactive-measures standard was justified in China under general tort principles. But the final version of the ECL leaves it unclear whether these judicial opinions are remain good law. Article 28 of the ECL requires platforms to publish the identifying information of vendors. By contrast, prior to the ECL, vendors had the option of identifying themselves by simply offering the public an unregistered trade name, thus making it difficult for IP owners and consumers to locate and investigate their illegal behaviour. Most major platforms in China are yet to implement Article 28. The reasons for this are unclear, but it may be due to the lack of implementing regulations clarifying their precise obligations. Among the other issues yet to be clarified in Article 28 is whether it will be deemed binding on Chinese platforms that mainly focus on export buyers, such as DHGate and made-in-china.com, or whether only platforms targeting local buyers will be required to comply. Without resolution on this point and others in future implementing regulations, test cases may be necessary in the future to force the government and courts to take a stand on these issues. Article 10 of the new law requires vendors that have not obtained business licences to do so, and in parallel, register with local tax authorities. It seems reasonable to assume that platforms would be required or have the discretion to terminate service to any vendor that fails to comply with these requirements. But the ECL does not explicitly state either proposition. Instead, Article 10 simply requires that platforms forward any identifying information they receive to the local market supervision bureaux and to remind vendors of their obligations to undergo company registration locally. As such, it appears that the power to enforce registration requirements will rest with local market supervision bureaux (which may or may not have the resources or motivation to do so), thus potentially leaving platforms off the hook for enforcement. Infringing goods often fail to meet government-imposed standards for protecting consumer health and safety, and IP owners thus have the option to file administrative and criminal complaints based on the Product Quality Law and corresponding provisions of the Criminal Code. Article 38 of the ECL Law imposes a clear duty of care on platforms to protect consumer safety, specifying that joint and several liability will be imposed where they fail to “take necessary measures” against goods or services that “do not meet personal or property safety requirements” when the platform operator “knew or should have known” of such sales taking place. Article 38 further requires platforms to examine the qualifications of vendors, while Article 27 requires them to verify that vendors maintain accurate records of administrative licences. Article 80 meanwhile grants market supervision bureaus the power to impose fines on platforms that fail to verify vendor information. It remains unclear for now just how thoroughly these provisions will be enforced. But IP owners may well enjoy faster and more satisfying results if they are able to present platforms with evidence that an infringer either does not have the required certifications (eg, the China Compulsory Certificate) or that test results issued by government-approved labs (financed by the IP owners of course) confirm that the goods fail to meet relevant standards. Social media: covered or not? In response to more predictable IP enforcement on trade platforms, infringers are increasingly moving to social media to advertise and sell their goods. Often, advertising and transactional behaviour takes place behind the veil of members-only chat rooms that cannot be monitored by IP owners or even Chinese enforcement authorities using normal software tools. Regrettably, the new ECL does not specifically mention social media, but it is hoped that this gap will be addressed in the upcoming implementing regulations. The provision in the ECL that provides the clearest clues regarding coverage of social media is Article 9, which defines ‘e-commerce platform operator’ to cover entities that “provide a virtual place of business, transaction matching, information release and other services to parties of e-commerce transactions to enable them to carry out independent transaction activities”. In light of that language, we suspect that social media service providers will likely argue that Article 9 should not be applied to their businesses, as they were not created with the main purpose of facilitating trade in goods and services. Social media platforms are also likely to argue against measures that would require them to compromise the privacy of users that establish closed areas for communication by allowing the platform itself, let alone IP owners or government authorities, routine access to posted and hosted content in order to monitor for ECL violations. The provision in the new law that has stimulated the most controversy to date is set out in Article 43, which appears to require online trade platforms to halt IP protection measures for given listings if the vendor files a counter-notice containing “*prima facie* evidence of non-infringement” and the IP owner does not submit evidence within 15 days of its having filed a civil or administrative complaint. the apparent obligation of platforms to halt enforcement measures, rather than merely having the discretion to do so. Concerns have also been expressed over potential real-world consequences of Article 43, including the likelihood that counterfeiters and sellers of clones will exploit the new provisions by flooding platforms with bogus, unsupported counter-notices. Most IP owners are already overwhelmed by the number of online ads for counterfeits and clones, and few have the resources to file civil or administrative complaints against even a fraction of the vendors of those products detected. And while in China administrative enforcement is viewed as an inexpensive and fast way of resolving most trademark infringement cases, the market supervision bureaux have generally proved unwilling to take enforcement action in routine online cases, arguing difficulty in asserting jurisdiction where the precise location of the infringer and its stocks are unknown. Many Chinese platforms have been lauded for their willingness to thoughtfully consider more complex infringement cases, but there is now a palpable fear those platforms will feel compelled to side with infringers due to the seemingly mandatory language in Article 43. Of course, the ills of Article 43 may well be cured in part by the future implementing regulations to the ECL. But there are fears – even among some sympathetic platforms – that the plain language of the ECL itself will make this impossible. Articles 74 to 88 of the ECL set out the penalties – monetary and otherwise – that may be imposed in case of non-compliance. In most cases, the enforcing authority is the local market supervision bureau. The article of most relevance for IP protection provides that, in case a platform fails to take necessary measures against IP violations, the market supervision bureau must first provide a warning and opportunity to the platform to rectify the violation within a prescribed period, failing which a fine of between Rmb50,000 and Rmb2 million (approximately between $7,300 and $295,000) will be imposed. Administrative fines by the market supervision bureaux are likely to be rare, as the threat of action will probably be sufficient to change behaviour. Almost all of the provisions in the ECL relating to IP protection leave critical questions unanswered, and there are no guarantees that the future implementing regulations will be issued soon, or if they are, that they will resolve these questions in manner friendly to IP owners. Efforts by industry to lobby over the contents of the implementing regulations and influence how the ECL is otherwise applied in practice are meanwhile likely to be hamstrung by a continuing lack of transparency with rule makers and the strong support that the government continues to give to the e-commerce players as a whole. Given that sorry state of affairs, what can IP owners do in the meantime? pushing for more favourable interpretations of the ECL through test cases. Cooperation among IP owners operating in the same industry in investigations, reporting to authorities and policy work are also advisable where feasible, including collective engagement with platforms on salient problems. Chinese platforms will meanwhile need to continue investing greater resources to build their IP protection teams and technical capabilities to achieve more cost-effective results and keep the level of complaints by consumers, IP owners and governments in check. Those platforms will also benefit from greater cooperation with government and industry groups in experimenting with new technologies and processes, and in responding constructively to concerns over measures they adopt that limit the ability of IP owners to cost-effectively police their markets. Platforms should also consider experimenting with new ways of resolving disputes that they regard as too difficult, for example, through accelerated arbitration and the use of China’s new internet courts. Note: A version of this article also appeared in World Trademark Review’s Guide to Online Brand Enforcement 2019.